Here’s to those with real talent! Here’s to those foolish enough to think they can make a movie about nothing but non-stop action – and figure out a way to make it work in a way that these movies haven’t always worked before. Here’s to director George Miller who made the latest “Mad Max” such a furiously-intoxicating adventure. 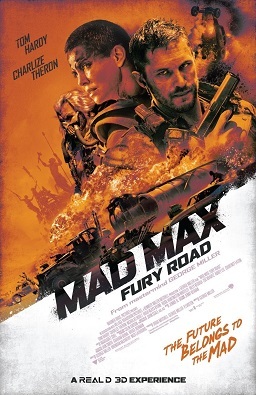 This is a two-hour chase film across miles of open desert somewhere at the edge of the planet in the dystopian future. The story is simple, but the telling is so disciplined, so determined, so well-paced. In the brutality, Miller has found beauty; against a parched landscape filled with chaos and confusion, he’s choreographed a dance. Yes, it’s often dark and gruesome; characters appear and disappear, often violently; it’s sometimes unclear exactly what is going on; we don’t always have the explanations or sense of completion we expect. But Miller seems to have done everything he could to make sure this is not just another movie created in the computer and devoted to mindless death and destruction. He tells us only what we need to know – and moves on. Nearly three-quarters of the effects in the movie – men swinging on the end of giant poles across lanes of speeding vehicles, motorcycles ripping and flipping down sand dunes, heroes and villains slugging it out as they hang upside down out truck windows – were actually staged. The attention to detail shows. Although the film relies on pyrotechnics and physically-impossible feats, the result is an imaginative and entertaining exploration of a franchise begun more than thirty-five years ago. This is the fourth film in the series, but more than a reboot, it’s a reimagining. And it all works spectacularly. The most difficult thing to believe about the whole movie may be this: George Miller, who directed all four films in this brutal and gritty franchise, also directed the gentle and humorous “Babe: Pig in the City” and both “Happy Feet” movies. Let’s hear it for real talent.